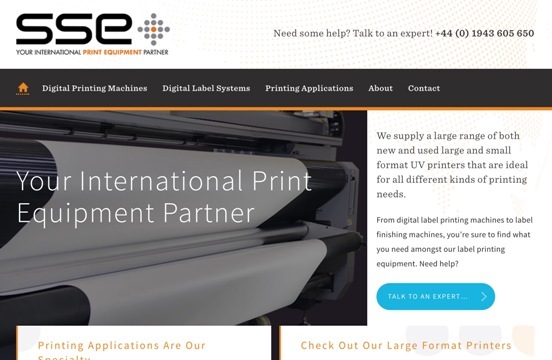 SSE Worldwide Digital Printing Equipment is a leading global supplier of new and used printing equipment including Canon Oce, Inca, EFI Vutek, Mimaki, Thieme, Natgraph, Fuji Sericol, Agra, Roland DG, Kongsberg, Zund, Sakurai and HandTop. The company also supplies an extensive range of accessories, such as automatic screen cleaning equipment, squeegee rubber, squeegee cutters and grinders, screen stretching equipment, eco-friendly screen cleaning chemicals, gas dryers for textile or graphics use and U.V. dryers, including table top models.